I was instantly attracted to this blouse from H&M due to the cute and colorful parrot print. It was also the first "peplum" style blouse in my wardrobe. I honestly did not know what peplum was referring to until last Spring. Peplum tops appear to be all the rage now. The thing I like about peplum tops is that they can be worn casual or dressed up, for example with a pencil skirt to accentuate the "frills." 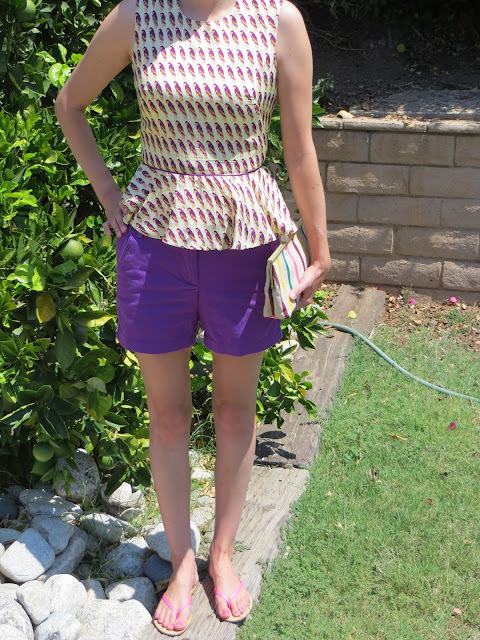 I decided to pair my H&M parrot peplum top with the 4" chino shorts from J. Crew for a casual look. To accessorize I added a bit more color with the J. Crew Candy Stripe Jute clutch. I love this clutch because of the neon stripes. The colors happen to match with all of the J. Crew chino shorts I purchased for summer this year! The other thing I love about this clutch is the size. It easily fits my wallet, my husband's wallet ( I'm not sure why he makes me carry it), sunglasses, phone and keys. So all in all it is a very practical clutch, which is rare. i'm so envious you can wear peplum! i adore the printed birds on this, too cute!